An Post Chain Reaction rider finished behind Mark Cavendish today. Sam Bennett leads the field during stage five of the 2013 Tour of Britain. IRISH RIDER SAM BENNETT of the An Post Chain Reaction team has claimed second place on the final stage of the 2013 Tour of Britain, finishing off a great week for the team. He was beaten to the finish line today by Mark Cavendish, who won the final stage of the Tour of Britain for a third year in a row. The overall win on the Tour went to Bradley Wiggins, who added the title to his Olympic gold and Tour de France in 2012. Bennett’s finish rounded off a great tour for the An Post Chain Reaction team, as fellow rider Shane Archbold picked up today’s award for most combative rider. Bennett also won Stage 5 of the Tour on Friday, as he sprinted to victory in Caerphilly, while Aaron Gate claimed the Sprint Classification on Stage 1 and Stage 4. “Sam’s achievements this week have been brilliant, it just shows how talented a rider he is and at 22 he has a great future ahead of him. “That he has been called up to the team for the World Championships in Florence highlights this. Email “Second place for Irish rider Sam Bennett in Tour of Britain's final stage”. 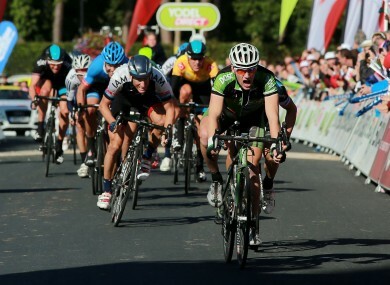 Feedback on “Second place for Irish rider Sam Bennett in Tour of Britain's final stage”.